Even though it is one of the most used areas of the home it is many times not taken into consideration when it comes to home décor. 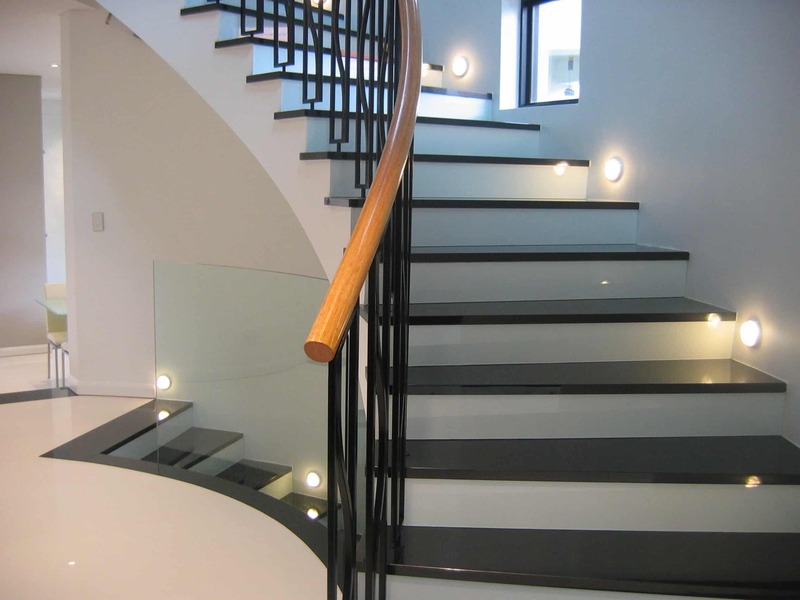 Although it is sleek and narrow your staircase can still get the same decorative treatment as the rest of your home. In fact, your stairway is an excellent space to incorporate different decorating styles that would not be as appealing in the rest of the home. These decorating ideas will give your stairway the step up it needs to be one of your favorite areas in your home. 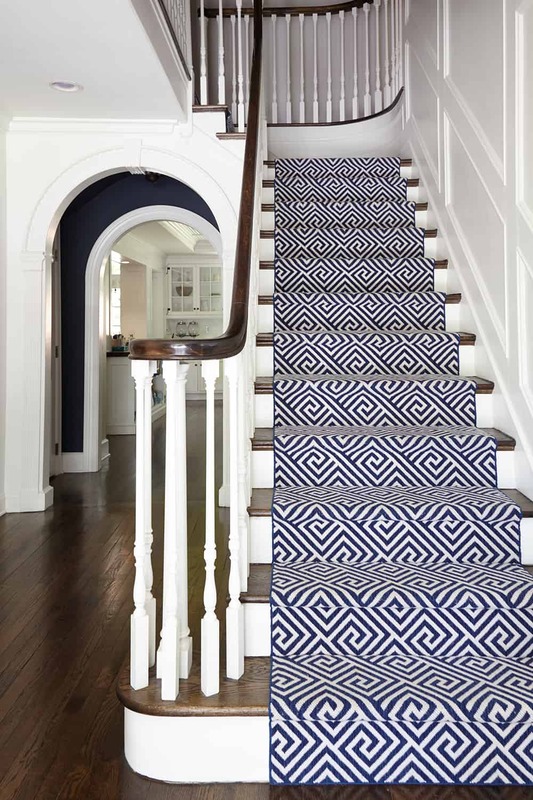 Instead of using a black or white staircase runner consider using a navy one. Navy is an excellent substitute for the neutral tones. When it comes to bold patterns contemplate having a repetitive pattern that continues throughout the entire runner. Stair runners are typically used on stairs that are made out of wood and need a bit of traction in order to avoid any falls. However, add visual interest to your stairway by having a stair runner in a bold pattern. Bold patterns add visual appeal as well as a second layer of dimension to the space. For a beach feel that is not entirely focused on being beachy. Only paint the center of your stairs a pastel blue. This will give you the blue hues you want while still being neutral and understated. 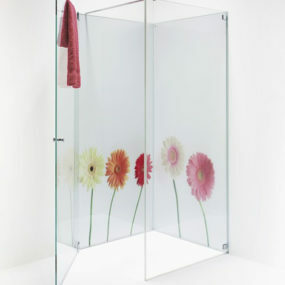 This is the perfect way to give an impact while being understated. 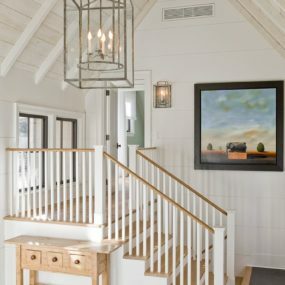 If you do not live near the beach, but you want to incorporate beach vibes into your home painting your stairway a beautiful shade of blue or sea foam green is the way to go. Embrace the stairway surrounding and add pastel décor and colors to bring the entire beach vibe decor together. 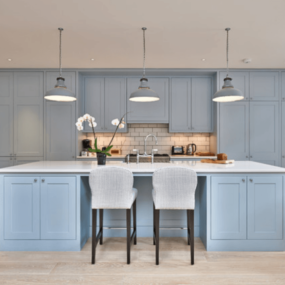 Different shades of blue will create a different atmosphere. For a classic nautical feel paint your staircase a deeper shade of rich blue or navy. Meanwhile, for the classic beach feel stay in the pastel blue family. Stairways tend to typically match the rest of the home. In fact, many homeowners will leave this area of the home white and without decoration. 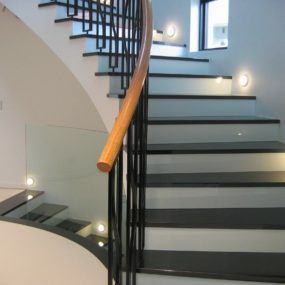 However, when you want to upgrade your staircase the best way to start is with the wall that connects your stairs. Add a bold wallpaper to brighten up the space. 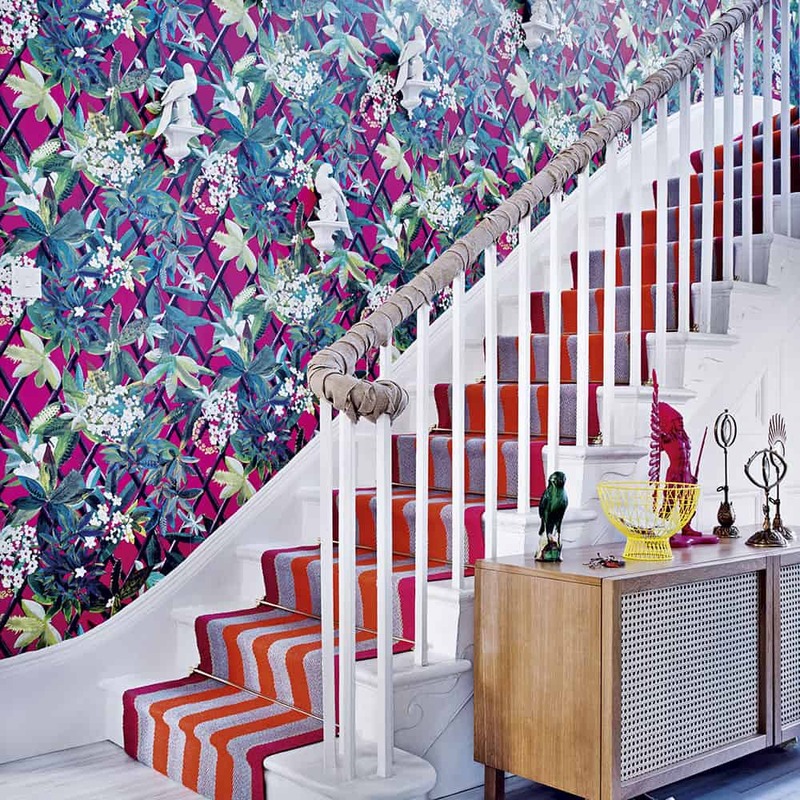 Consider continuing the wallpaper up to the second floor of your home for a cohesive effect. 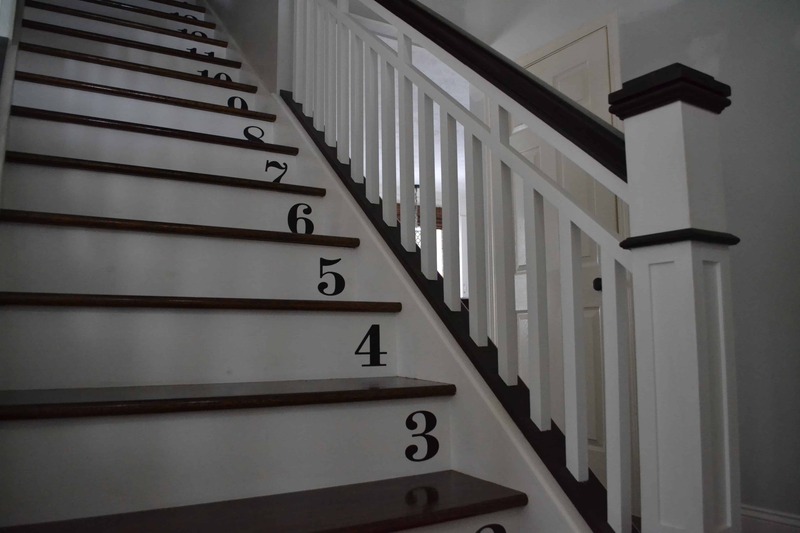 Numbering your stairs can be done in different forms. You can choose to label the stairs from top to bottom or from bottom to top. Or you can even choose to make every number a different color for a modern twist. Add numbers to the bottom of each step. 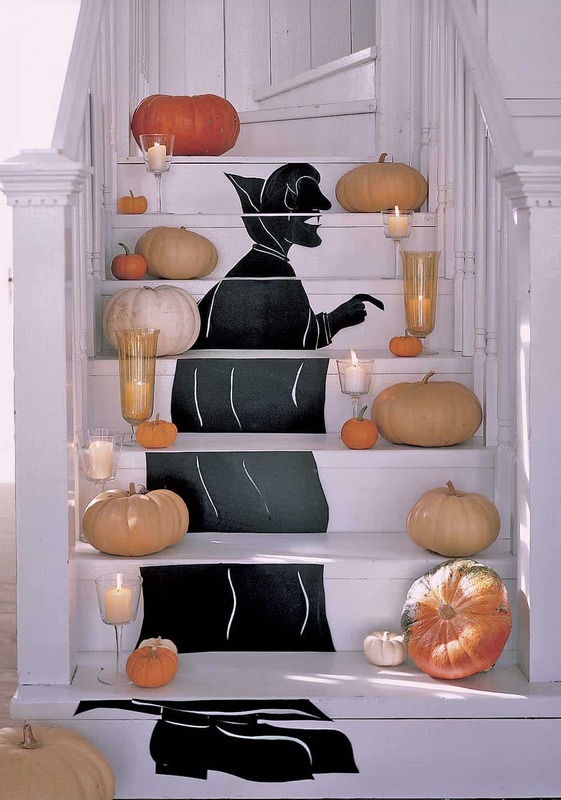 This is a creative way to add an intricate twist to your staircase. If you happen to have children this can help them learn how to count while adding a modern twist to your home. 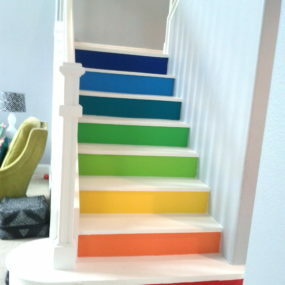 This can be done by stenciling the numbers onto your stairs in white paint or by selecting a bold colored paint instead. Match your staircase wall photos to the ones on your stairway riser to create a classic look that is still extremely modern. Choose classic photos that add to the ambiance of your home and decor. 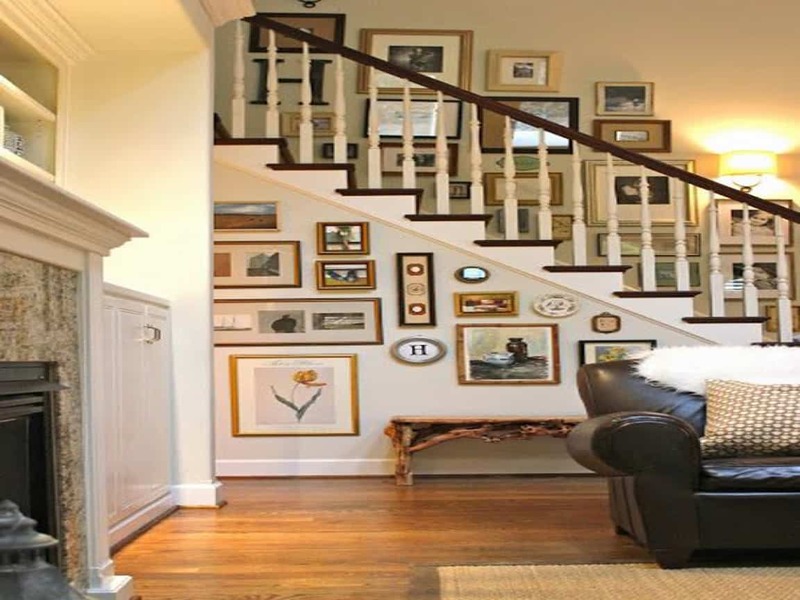 The stairway tends to always lend itself to becoming the ultimate picture section of the home. However, to add a modern twist to your stairway create a picture gallery on your staircase risers instead of your stairway wall. This is an excellent way of displaying artwork in a non-traditional manner. An oak log handrail can completely transform your stairway as it gives it a unique twist. 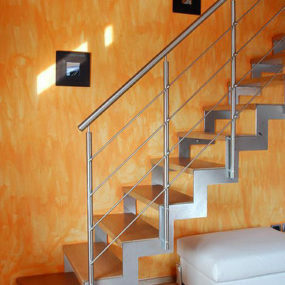 If you want to completely change up the look of your stairway this may be the way to go. Especially if you want to add a rustic twist that is not a statement piece. Rustic has become the trend to follow. Therefore, it is only right for you to want to incorporate a rustic touch to your staircase. This can be done by interchanging your traditional staircase handrail for an oak log handrail. 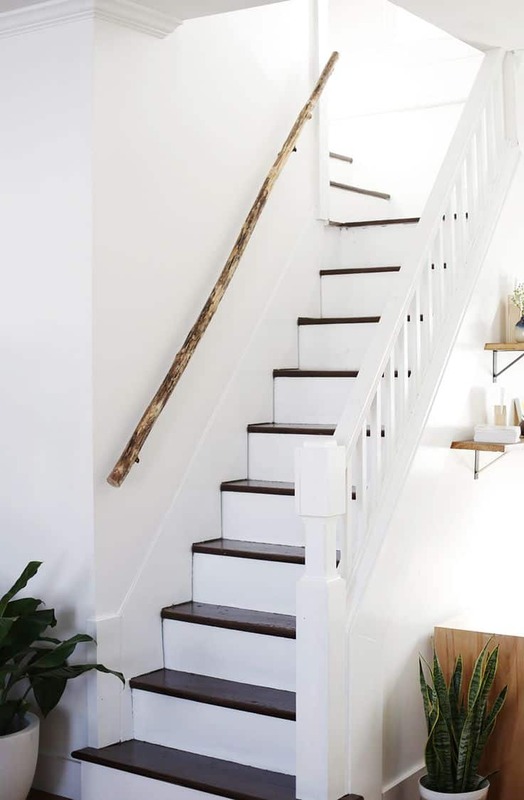 Doing so will give you a woodsy feel to your stairway while still having a rustic feel. If you want to make a bold statement in just one area of your home. 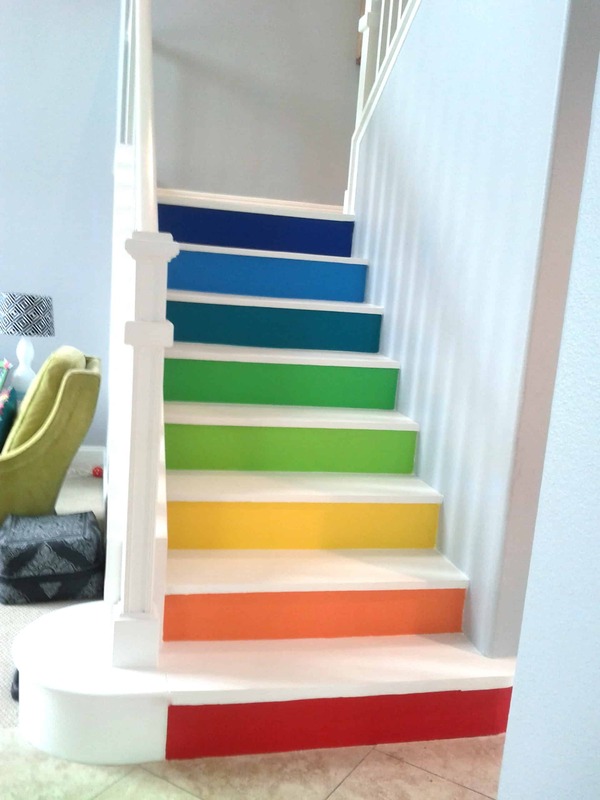 Consider painting your stairs different shades of color bright colors. This will add visual appeal to your stairway area without having to add more decor to the area. Why paint your stairway black or white when you can paint them multiple different shades. We suggest pastel tones as they are easy to work with and decorate around. 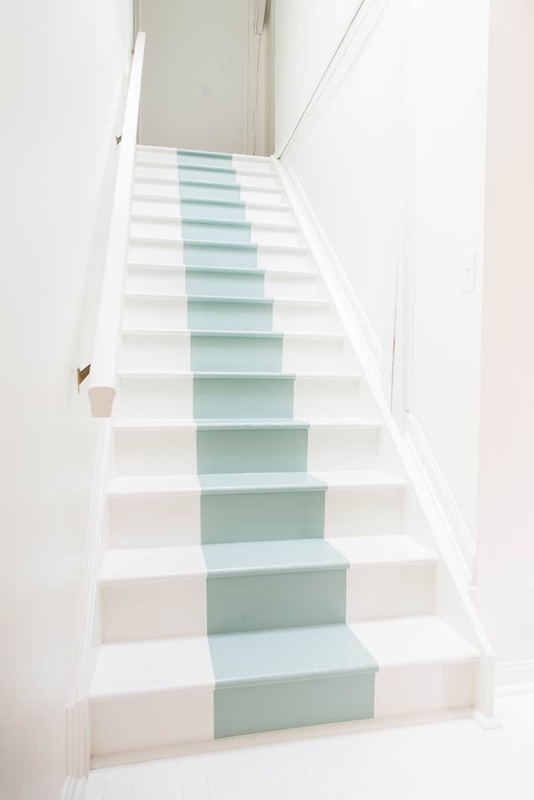 Use two or three different pastel tones and variations between the colors when painting your stairs. This is an excellent way of adding color and visual appeal in a subtle manner. 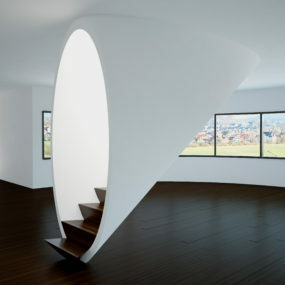 Having a small staircase does not mean that you cannot add an interesting piece of art to the space. In fact, you want to add a medium to large piece to divide the space and bring intricacy. 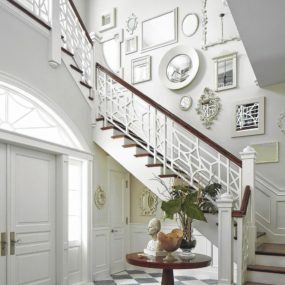 Instead of creating a collage of multiple different pictures and putting them together in your stairway get a large art piece. 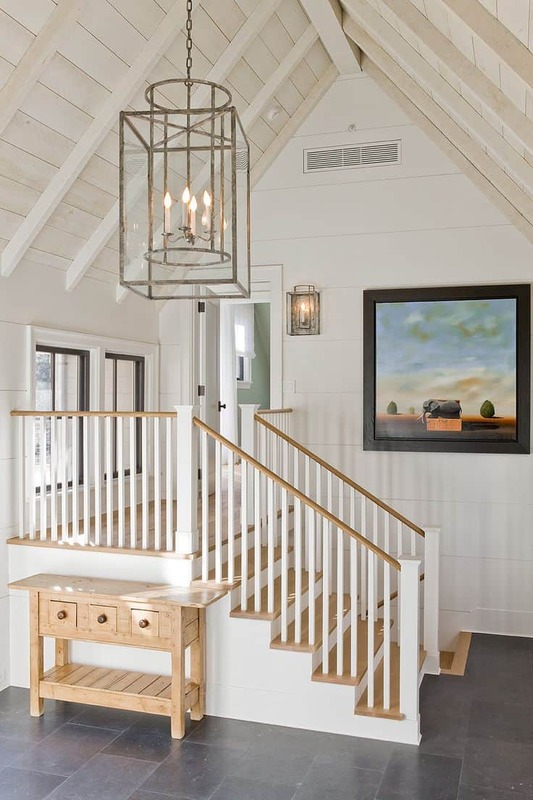 A large art piece will create a focal point in your stairway while being versatile and artsy. 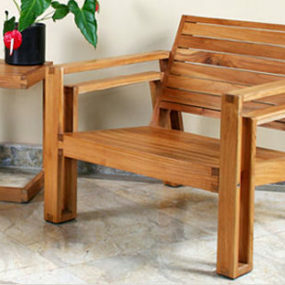 It’s a statement piece that cannot be ignored, which is exactly what you want to create in this section of your home. Having outdoor materials indoors may seem like an intimidating decor option. Therefore, if having rakes or shovels on your wall doesnt seem like the outdoor decor you want to bring indoors consider having floor outdoor lighing instead. Outdoor lighing at the base of your steps can be a great addition to your decor. 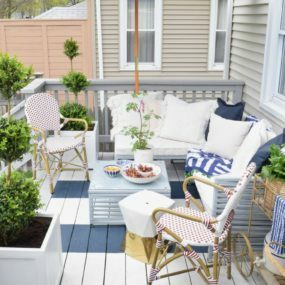 Bringing outdoor décor into your home has become one of the latest trends to become a hit in many homes. Large striking objects such as rakes or shovels are an excellent yet contemporary way of bringing the great outdoors right inside. The holidays are the perfect occasion to give your home a slight upgrade in decor and your stairway is the perfect place to begin. Pumpkins are perfect decor options you can use them during Halloween or paint them different colors for other holidays and occasions. 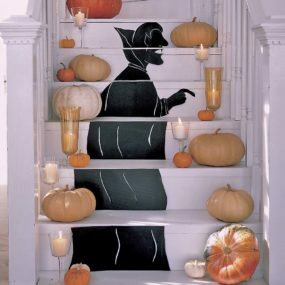 If you are looking for a cheerful and creative way to add décor to your staircase that can be changed anytime you would like. Consider adding holiday décor in your stairway space. Every holiday you celebrate you can interchange your décor and add fun pieces that resemble that holiday occasion. How will you update the stairway in your home? Let us know in the comments below if you have other ideas and trends for the staircase area in a home.